Greetings, fellow webizens! It is my great honor and pleasure to introduce Luc Reid: stalwart founder and fearless leader of the Codex Writers’ Workshop, dear friend, and all-around ultimate personification of neat-person-ness! Let’s hear what he has to say for himself. 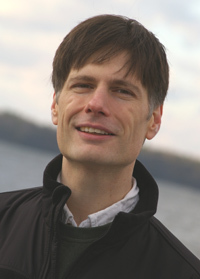 I’m Luc Reid, a Writers of the Future winner, founder of the Codex online writers’ group, and a frequent blogger on writing, the writing life, and the psychology of habits, for instance with posts several times a week on my blog and with a monthly column on writing motivation at Futurismic called Brain Hacks for Writers. My latest book, Bam! 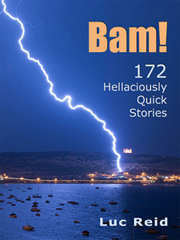 172 Hellaciously Quick Stories is available on Amazon for the Kindle and on Smashwords for all eReaders, with a print version expected out this month. Bam! collects the best of my flash fiction, throwing normal people into strange circumstances in stories that can each be read in a few minutes. Cinderella tries to get a grip after her divorce; inventions go horribly wrong; robots rebel; a thinking teddy bear is trapped for decades in a toy box; love blossoms in a hotel corridor unmoored from time and space; dinosaurs invent the steam engine; girlfriends blink in and out of existence; and Very Bad Things happen that might be worth it in the end. And now, let’s grill him a bit! I’m a high school drop-out. In 1985, in 10th grade, I heard about a tiny, academically vigorous college in southwest Massachusetts that accepted students out of 10th and 11th grade without a high school diploma on the idea that some people can get bored with high school academics and be in danger of being turned off to school entirely if they didn’t get something more challenging. That definitely described my feelings about school in 1985, and as promised, Simon’s Rock was much more challenging. I earned my B.A. in Humanities four years later, but I never did get a high school diploma. What’s the best writing advice anyone has ever given you? What’s the worst? The best writing advice I’ve ever gotten was from Orson Scott Card, who drilled the idea into 20 of us at his first Literary Boot Camp in 2001 that writing well means writing all the time–not waiting for inspiration, not getting dragged down into the mire of our self-critiques, and certainly not eschewing the keyboard to stand by the mailbox waiting for responses from editors and agents. The worst writing advice I ever got was to read a huge stack of classic literature that didn’t really interest me: it was explained to me that until I understood the literary context in which my work existed, based on the history of literature to that moment, I wouldn’t really understand how to write. Don’t get me wrong: I agree that writers have to be readers, but I frankly don’t believe historical context counts for all that much when you’re trying to write a compelling novel or story: there are much more important things (like character, emotion, tension, and immediacy) that deserve our attention instead. Have you ever had the occasion to vehemently disagree with your agent/editor about a change to the MS, and if so, how does that sort of thing get settled? I had some vehement disagreements with a copy editor who undertook, word by word, to destroy my book Talk the Talk: The Slang of 65 American Subcultures (Writer’s Digest Books, 2006). Her “corrections” did things like change the definition to the wrong part of speech. She also had little notes in the manuscript about things she didn’t find believable, which might have been of a little more interest to me if she had any special expertise in any of the subject matter and/or if I didn’t have documented sources for every single term in the book. My editor, Michelle Ehrhard, kindly took my corrected version back and allowed me to reverse the very great majority of the copy editor’s changes. In marking up the manuscript, I’m surprised I didn’t manage to carve the word “stet” into the surface of my desk through repetition. However, that same copy editor taught me that “e.g.” should be followed by a comma, for which lesson I am grateful. I’d love to know how you *get rid* of ideas- how you isolate the concepts that won’t work in a story, or the story ideas that you just won’t have the patience to tell, or whatever. Is there some litmus test an idea has to pass? Do you just write it up and realize at some point “well that’s not working”? * Does this idea have emotional juice for me? Is there something in it that, if I write it well, will impact on me in the heart or the gut? * If this idea has been done before, am I doing something truly different and worthwhile with it? * Is there conflict embedded right in the idea? * Am I going to be able to tell the story without having to explain or justify things all the time? * Am I excited to discover what I’ll come up with? * Does the idea come to life in my head as soon as I start thinking about it? * Do I know enough about the subject matter (or am I willing to do the research) to do this idea justice? * Does the idea fit the genre, length, and audience I want to write for at the moment? * Will I be able to summarize what’s interesting about the story I write from this idea in just one sentence? If the idea doesn’t pass all of those tests–and most don’t–then I generally don’t use it, or at best let it offer a subplot or scene to something I’m writing based on another idea. I know a lot of writers prefer to go with whatever grabs them. I think the danger in this is that what grabs us has a lot to do with what we’re focusing on at the moment. Just because one idea seems extra appealing at the moment doesn’t mean that another idea won’t be just as appealing if it gets its chance. So I like the idea of choosing an idea that suits my needs and that I can get excited about. How do you keep the pace and interest going when you also need to showcase your world? My feeling is that good fiction writing is generally doing at least two things at once. For instance, a particular passage could help us understand a character and increase tension, or deliver backstory while moving forward through a meaningful plot incident, etc. If you’re showing off the world of your story, you can keep your reader’s interest if you are doing it e.g., from the back of a galloping horse while exchanging arrows with a pursuer, or through a character who inadvertently makes their prejudices and desires clear in the course of showing something to another character. For example, if you’ve ever seen the movie The Princess Bride (or read the book, which is a little different but just as good), you may remember the scene where the Man in Black and Inigo Montoya have a sword fight at the top of a cliff. In that scene, William Goldman (one of my favorite screenwriters of all time: he also penned Butch Cassidy and the Sundance Kid) gives us the action of the sword fight, the tension of the pursuit by the Man in Black layered over the tension of the kidnapping of Buttercup, entertaining dialogue, our first close-up view of the Man in Black, our first chance to see Inigo Montoya in action, and a couple of clever reversals. My belief is that it’s no coincidence that so many things are going on given that this is one of my favorite movie scenes of all time. Many thanks for the chance to join in this discussion. Hey, guess what? Even though I sprung this on him, I’m going to go ahead and go out on a limb and say that Luc is probably going to hang around for discussion for the next couple of days, if you have any questions or comments on his work or his interview. So as always, join us in the comments section! And visit the official Codex Blog Tour page for more interviewey goodness! Do you usually know what “voice” you’re using along with the idea for the story itself? A story can after all become a totally different beast depending on the point of view. Is that part of the idea “coming to life” for you, or do you need to try out different angles? Also- phew, flash fiction? It’s infamously harder to write well in brief than at length.Have you ever turned up an idea in your short tales that really begged for more time in your later writing? And would such a thing be considered a sequel, an expansion, or what? Thank you for the Codex interviews! These are questions that require thinking! Just a minute while I recruit another hamster to help power the Think-a-Tron. About voice, it seems to me that it’s essential to know what point of view you’re writing in, since it has to appear very early on. Sometimes, though, I have to go back and start over when I realize I’ve chosen the wrong one. Usually I try to save first person for stories with a single narrator who has a special take on the world and a special way of talking, though there are certainly different schools of thought on that among writers I admire. I usually avoid third person omniscient because it makes it much more difficult to get deep into the character’s brain, which I usually like to do. Still, I can’t deny that 3PO works very well sometimes if you’re trying to present a broad story. And yes, my experience is definitely that POV is part of the story coming to life. The wrong POV seems to keep stories feeling awkward and underpowered, while the right point of view suddenly clears things up and lets the story flow (if the other important elements are in place). Have you ever turned up an idea in your short tales that really begged for more time in your later writing? Yes–and no. Usually when a flash piece opens up ideas for me, I follow up with more flash pieces in that line. Cinderella’s divorce was like that for me, and “Something Was Different.” (I also have conceived some flash series as series, for instance one about aliens on earth who are isolated in some way and Parthenia Rook, Adventuress). Sometimes I fail to tell the story I thought I was telling in the available space and realize I’m writing a short story instead of a flash piece, though that doesn’t happen very often to me these days (and strangely seems mainly to happen when I try writing from story prompts rather than spontaneous ideas). But it’s very rare for a flash piece of mine to feel to me like it should be a novel, or to feel like it should be expanded into a short story if it works as a flash piece. This may be because I’ve gotten too used to the idea of it being a flash piece, but it may also be because I’m consciously trying to get my flash pieces to burn up all the potential of the story in one short burst, leaving only lesser things unused if the story were to be expanded. Fortunately, it seems to me that there’s almost always a lot more that a story could potentially do than it actually does, so I don’t think that will necessarily prevent me from using flash pieces as a basis for longer pieces if I want to down the line. Luc- Thanks for your thoughtful replies, and for the Codex! You give hope to this fellow high-school dropout.